This week I bought a new hat. 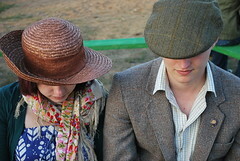 Not just a baseball cap or a stocking cap; a flat cap. Wear a baseball cap and no one notices. Wear a stocking cap and no one notices (unless its the summer). But I’m not wearing this hat to stand out – I’m wearing it cause I like it. However, no matter if its a hat, a shirt or a new business; if its against the norm, people will stare. People will take a second look, question your intentions and sometimes even ridicule you. That’s okay, embrace it. It means you’re taking a step away from status quo. It means that you just might be on the way to something remarkable. What hats on your head? Ah the classics. My father wears flat caps year round. His father wore them as well. I figure I will start one day, when I am old enough to feel distinguished in them. I don't think I'm cool enough to pull them off yet. I'm telling ya man – You can pull it off. If you like that hat enough, you can rock it with confidence. It's too hot in our country now. The cup you is a good example to wear. I've got a couple around – but they're harder and harder to find, I think. Especially any ones with character to them.